Walking past the Welcome Center on the 1st floor of the new Beeghly campus expansion, don’t be surprised if you start hearing clicks, pops and clangs. 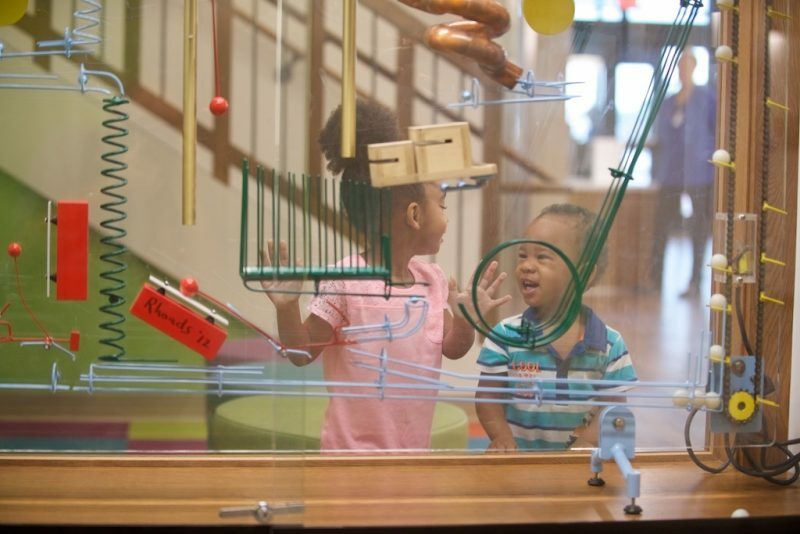 Those are the sounds of the ball machine – an ingenious audio-kinetic sculpture that’s become a hallmark of Akron Children’s. The artist, George Rhoads, is well-known for creating these unique sculptures that intrigue kids and adults alike. While waiting for an appointment, Jaxxon Hall Johns and Dallis Johns check out the ball machine in the newly opened addition on the Beeghly campus in Boardman. The first ball machine was installed at the Akron Children’s Hospital campus in Akron in 1993 and renovated in 2013. A smaller version of the ball machine is now on display at the Beeghly campus. And just what makes these ball machines so mesmerizing? It’s almost like staring right into the inner workings of a giant pinball machine that you could find smack dab in the middle of a Dr. Seuss tale. The colored track whisks balls along a path, bumping and falling into chimes and gongs as they create a playful melody.